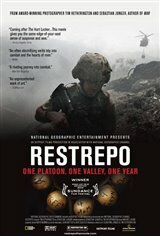 RESTREPO is a feature-length documentary that chronicles the deployment of a platoon of U.S. soldiers in Afghanistan's Korengal Valley. The movie focuses on a remote 15-man outpost, "Restrepo," named after a platoon medic who was killed in action. It was considered one of the most dangerous postings in the U.S. military. This is an entirely experiential film: the cameras never leave the valley; there are no interviews with generals or diplomats. The only goal is to make viewers feel as if they have just been through a 94-minute deployment. This is war, full stop. The conclusions are up to you.